Dubai, UAE, December 27, 2018: CASIO Middle East has announced the coming release of a new limited-edition collaboration timepiece in the UAE, the GA-110FRG-7A, which is the result of the recent team up between CASIO G-SHOCK and famous New York rapper, A$AP Ferg. The new model, which bears a design based on G-SHOCK’s original GA110 model, features a clear resin band and bezel with blue, red and yellow accents on the dial face complemented by A$AP Ferg's signature on the band loop and case back. 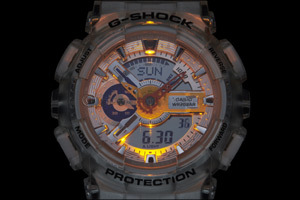 The GA-110FRG-7A, which comes in a custom limited-edition packaging, is set to hit UAE stores by February 2019. G-SHOCK developer Kikuo Ibe's concept of creating a watch that never breaks. 'CASIO G-SHOCK is legendary, and I am so excited to introduce this new model to the world. When I sat down to design my G-SHOCK watch, I kept thinking about how watches work. It brought me back to a memory I didn’t realize I had of my Aunt Kim’s bedroom telephone--a transparent phone where you can see all the inner workings and when it rang it lit up inside. That design was so beautiful to me. It had a bit of primary colors and touches of neon throughout. I wanted my watch to look the same way. Transparent with neon hits--clean and beautiful. I really enjoyed the collaborative design process and I think my fans are going to love the result,' concluded A$AP Ferg.